I woke up refreshed after a solid night’s sleep and set up my plan for the day: probate office, register of deeds, town library, and a walk about town. After learning about Sam and Joe’s guardian, Silas Staples, I was hoping there would be some early probate and/or guardianship records. It turned out to be a VERY quick visit since, unfortunately, the office didn’t have any records from 1859. I’m not sure what I was expecting as I walked into the Clerk and Records office, but I ended up getting more than I bargained for! A while back ago I found a deed for 80 acres of land Samuel Sturtevant, Sr. purchased just south east of Hudson in 1856. I figured I would find a record of the sale of this land and maybe another lot in the town of Hudson, pretty-straight-forward land record research I though. However, what I actually found took me on a six hour research frenzy trying to figure out the buying and selling of multiple properties in and around Hudson. I made two significant finds at the deed office. One: The Sturtevants arrived in Hudson about two years earlier than I thought! Sometime in 1853. Joe would have been only 2 years old. One land sale states Jemima Sturtevant, “recently of Broome County, New York.” (1) Wow, New York! I know Joe’s mom, Jemima, was born in Sullivan County, New York, but the last I found a trace of the family was in a 1851 Boston city directory so I always assumed they traveled from Boston to Hudson. Now I have another new direction to go for research. I wonder if the Sturtevants spent some time with Jemima’s family prior to moving west? Two: The other documents of interest had to do with the purchase and sale of the 160 acres of property father Samuel bought for his sons Samuel Jr. and Joseph. In November 1854, Samuel purchased the land near is now on the east side of state highway 35 along Glover Road about half way between Hudson and River Falls. 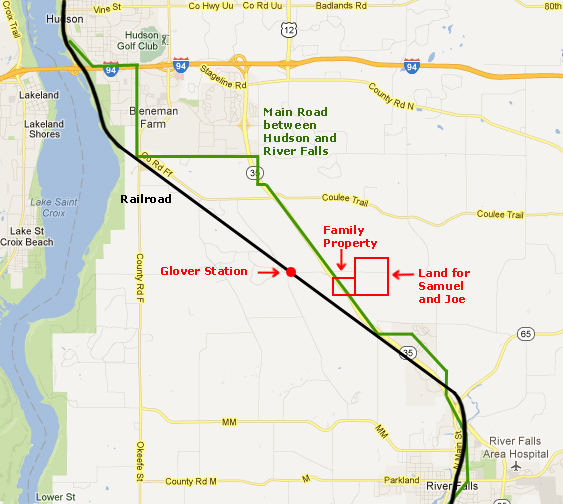 (2) There were additional land purchases near the area called Glover’s Corner (near the train stop of Glover Station) so it makes me think Samuel, Sr. was positioning the family near an area that had potential growth in the future. Using old plat maps I was able to locate the approximate location of the property the family owned in the 1850s. After Samuel Sr. died in 1859, Samuel and Joe’s legal guardian, Silas Staples, worked on the boys’ behalf to sell the land shortly after their father’s death, but it took several more years. Nearly ten years after the father’s initial $400 purchase Silas sold the 160 acres for $1200 (about $22,000 in today’s dollars) (3) It is not known if the money was held in some kind of trust for the boys or if the money was eventually transfered to their mother, Jemima for the family’s living expenses. After collecting as many land records as possible I made my way over to the library, but I really needed to grab a late lunch. It was nearly four o’clock and I was starving! 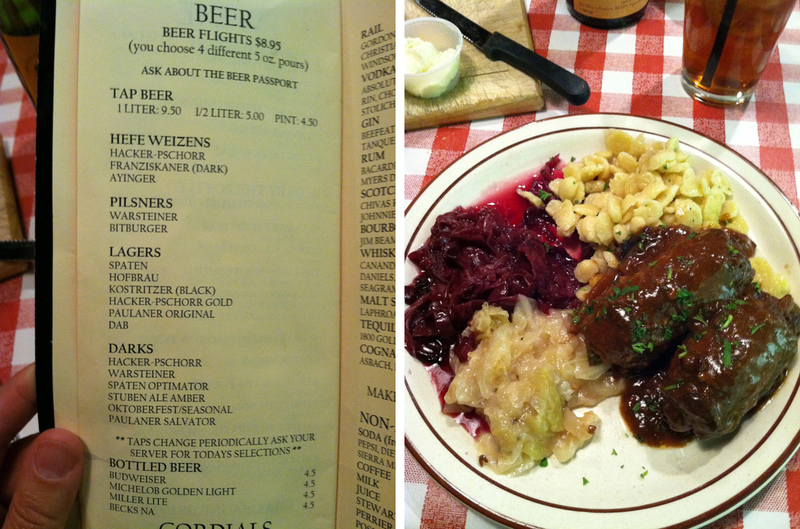 I found a nifty German restaurant on Second Street, the Winzer Stube. Some proper German food and a nice cold pilsner sounded like a perfect treat. The beer menu met with my approval and the Rinder Rouladen “Mutters Rezept” was a must! “Mom’s Recipe” for the beef rolls with spätzle and cabbage was almost as good as my own mom’s recipe. Lunch at the Winzer Stube. Yum! Feeling more relaxed and pleasantly full I headed over to the library to see what thier Local History Room had to offer. Luckily one of the genealogical society volunteers was still there to help me get started. She pointed me in the right directions and suggest quite a few books. Since it was so late in the day I didn’t spend much time really reading anything. I figured I would just read through everything later that night. I went into a copying frenzy of all the books and newspapers that had any kind of relevance. I took photos of anything that was too big to copy, such as some great early maps of Hudson! There were some wonderful old maps around St. Croix County and combined with my morning property research I was able to zero in on the properties Samuel and Jemima purchased in town. It’s not known if they lived on either of the lots and they did not own the properties very long. It appears they sold the lots just prior to moving to Sauk Rapids, Minnesota in 1856. No structures of this era survive along these streets today. 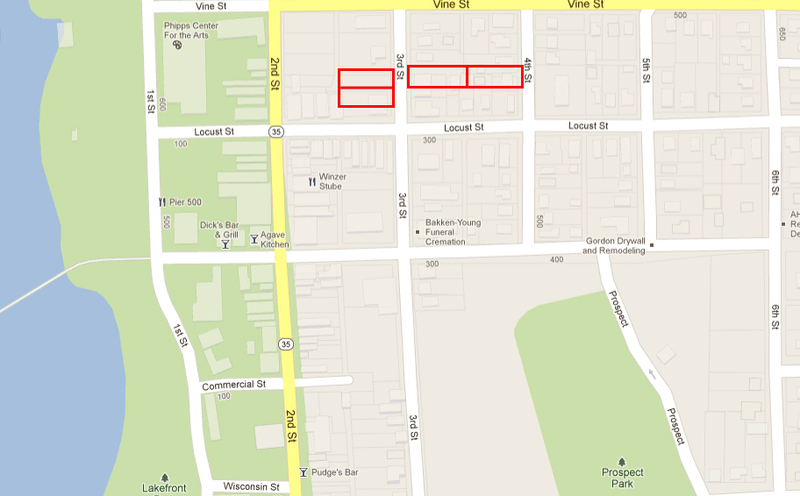 The approximate location of the four properties Samuel and Jemima purchased near the heart of Hudson in the 1850s. The library also had a great collection of newspaper issues that focued entirely on the town’s early history. These papers reprinted various letters, portions of books, old articles, and memoirs. A wonderful find to get a sense of what life was like on this little river town in the mid 1800s. The library didn’t have many photographs, but I was told to check in at the office of local paper, the Hudson Star-Observer, they supposedly have a good photo archive. I’ll have to visit the paper later, no time to get there today. One major event that I found out about was the large fire that occured in May 19, 1866. 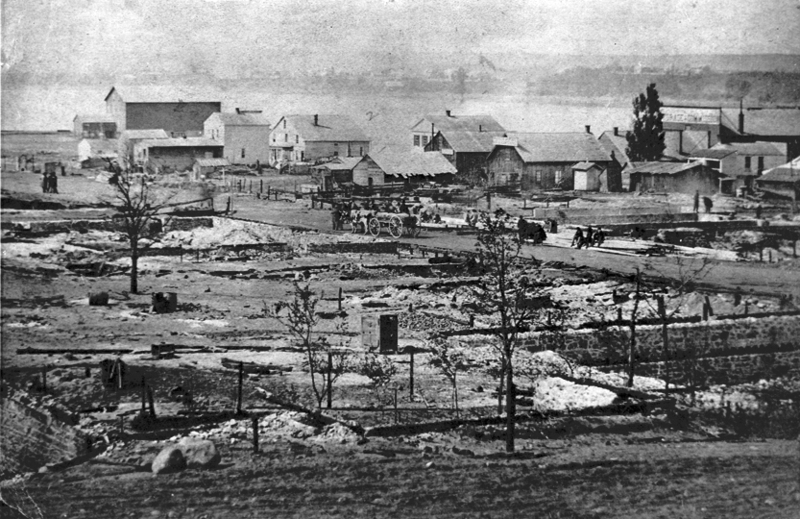 The fire destroyed many homes in the center of town and nearly all of Hudson’s small commercial district. As with most young frontier towns, buildings were constructed cheaply and quickly using timber. Not always a safe combination with the live-flame lighting and heating sources used during the era. Few early structures still survive to this day. The only building in the business district that survived was the brick harness and leather shop on Walnut Street between First and Second Streets. The day after the fire, 1866. Looking southwest from approximately Walnut and Second Street. Courtesy of the Hudson-Star Observer. Last building standing in the central business district after the fire. The structure has been nicely restored.. Photograph taken May 2012. 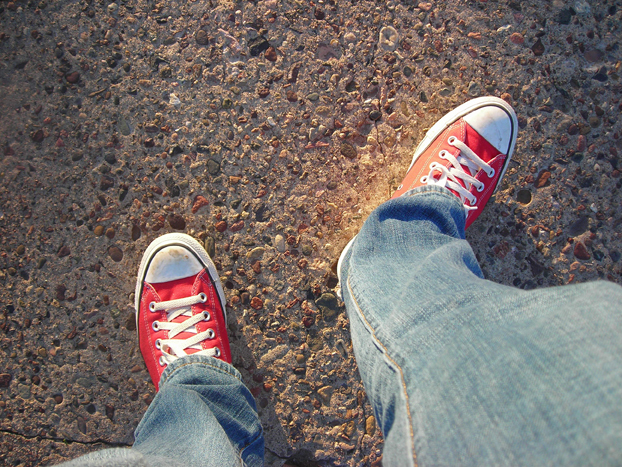 After a couple of intense hours at the library gathering everything I could locate, I decided to stratch my legs and took a pleasant walk around town as the sun was getting low in the sky. I wanted to get a view of town from the water so I walked about half-way across the former levee road to get a few shots. This road was for many years the area’s main connection across the St. Croix River between Minnesota and Wisconsin. Today only bicycles and foot traffic are allowed. Looking west to Hudson from the middle of the St. Croix River. Standing on the Wisconsin/Minnesota border in the middle of the St. Croix River. I also wanted to see the area where Samuel’s grocery store was located. Newspaper advertisements place his store “nearly opposite the American House, 1st street.”(6) The Local History Room volunteer at the library told me the American House was located where the old train depot now stands on the southeast corner of 1st and Commercial Streets. I haven’t found any details yet to indicate exactly which “opposite” direction the grocery store stood. Maybe on another trip I will have more time to uncover some more clues on the actual location. Ad for Samuel’s grocery store in the “Hudson North Star” newspaper in 1856. 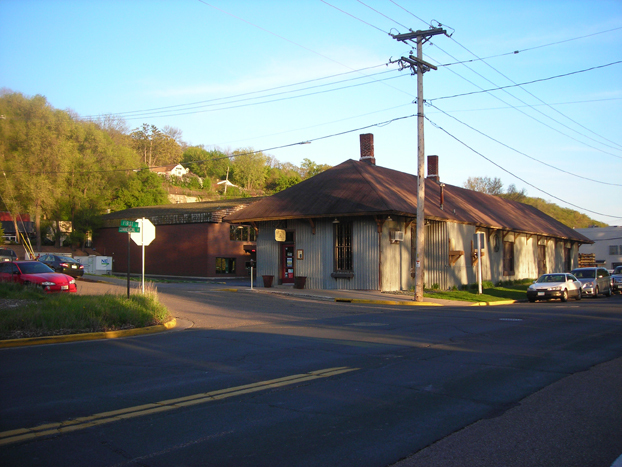 The old train depot on at the southeast corner of 1st and Commercial Streets. This is the general neighborhood where Samuel had his store. After my whirlwind day of record-gathering I packed it in, got dinner and made plans to take a road trip over to Minnesota for the next day. (1) St. Croix County, Wisconisn, Deeds, B:140, Lorenzon and Sarah E. Hender to Jemima Sturtevant, warranty deed, 21 Dec 1853; Register of Deeds, Hudson. (2) St. Croix County, Wisconisn, Deeds, H:300, Byron Brown to Samuel A Sturtevant Junior and Joseph B. Sturtevant, warranty deed, 20 Nov 1854; Register of Deeds, Hudson. (3) St. Croix County, Wisconisn, Deeds, P:390, Silas Staples for Samuel and Joseph Sturtevant to James Chinnock, warranty deed, 23 May 1863; Register of Deeds, Hudson. (4) Compiled service record, Samuel A. Sturtevant, Pvt., Co. G, 4th Wisconsin Cavalary; Carded Records, Volunteer Organizations, Civil War; Records of the Adjutant General’s Office, 1780s–1917, Record Group 94; Na- tional Archives, Washington, D.C. ; Additional evidence in the matter of the Original Invalid Pension claim, W. P Knowles, 31 Mar 1800, in Samuel A. Sturtevant claim (Pvt., Co. G, 4th Wis. Cav, Civil War), pension Inv. no. 270,484, Case Files of Approved Pension Applications, 1861–1934; Civil War and Later Pension Files; Department of Veterans Affairs, Record Group 15; National Archives, Washington, D.C.
(5) St. Paul Directory for 1867, vol 3. (St. Paul, MN: Bailey & Wolfe Publishers, 1867) 83, 211. 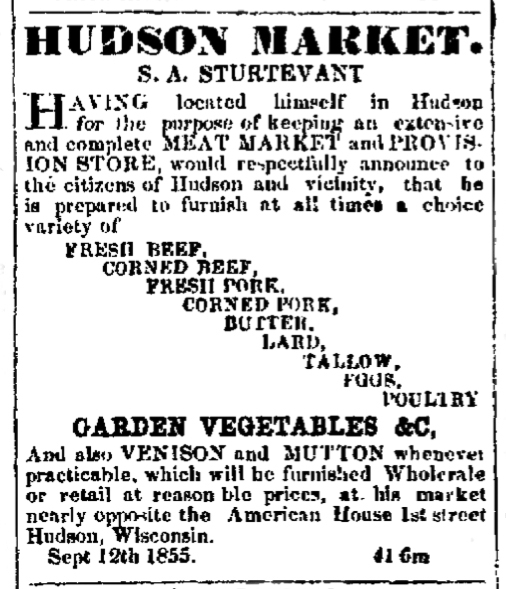 (6) “Hudson Market,” Hudson North Star, 2 April 1856, p3 c6. 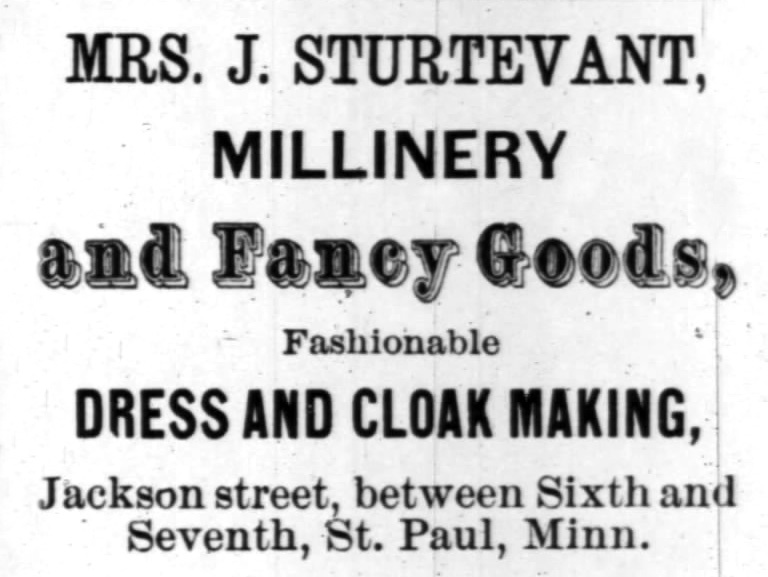 I have wanted to take a research trip up north for quite awhile, and when I found out about a work-related conference going on in St. Paul I jumped on the chance to arrive a few days earlier to do some Sturtevant family research. 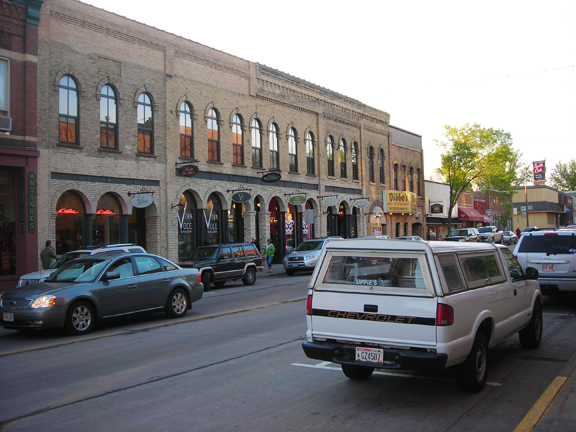 Joe’s father moved the family from New England to Hudson, Wisconsin in the mid-1850s. 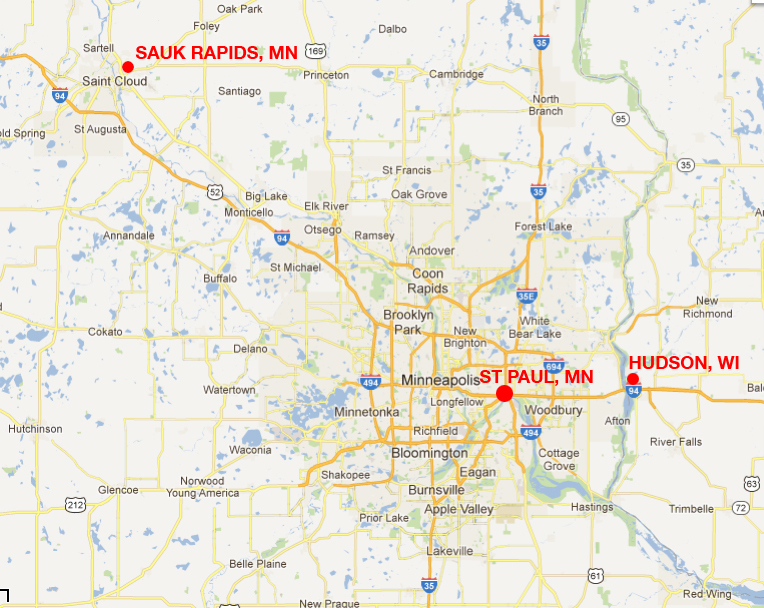 The family also spent about two years in the up-and-coming Mississippi River town of Sauk Rapids, Minnesota. After Joe’s father, Samuel, died in the summer of 1859, his mom, Jemima remained in Hudson for several more years to raise her four children before moving to St. Paul around 1866. I quickly realized that four days of research just wasn’t going to cut it with my ambitious schedule and quite a bit of driving…I’m just going to have to come back again. After a long night not sleeping at my hotel, I pondered over my plan of attack for the day at a greasy spoon taking in a LOT of coffee and some eggs and ham. Since the University of Wisconsin-River Falls Area Research Center didn’t open until 10 o’clock I had some time to kill. It was a chilly, drizzly morning and despite the weather I decided to stop by the Old Willow River Cemetery in Hudson to pay homage to several members of the Sturtevant family, including the patriarch, before embarking on my journey. I felt like the right way to start, and I’m glad I made the visit. After experiencing several curiously serendipitous moments through my days of research, I like to think papa Samuel was looking over my shoulder. Driving north through the small river-front town of Hudson I tried to keep an eye on the old buildings along 2nd Street, the town’s main drag. I recently found out a devastating fire took out Hudson’s business district in 1866, so as I drove along I wondered how many structures survived the blaze. Looking north on Second Street in Hudson. I turned east onto Vine Street and headed through the older residential area which was a surprisingly hilly landscape. Not extremely hilly, but the current banks of the St. Croix River are more prominent than the old bird’s-eye-view maps suggest. The tree-covered bluffs along the river’s east side hides much of the terrain. 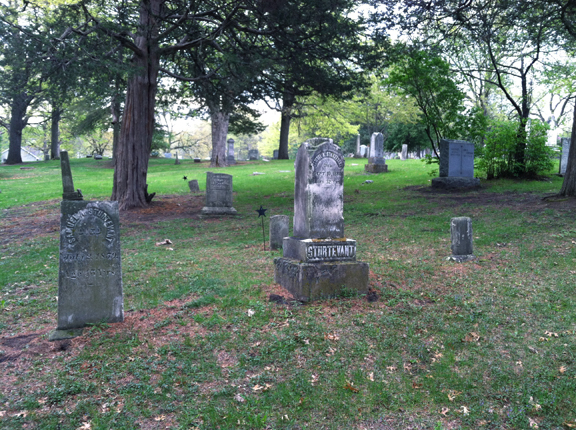 There are two Willow River Cemeteries, the old and new, I was definitely looking for the old one. Turning south onto 9th Street I kept my eyes peeled for what I figured would be an illusive entrance on Google Maps. Sure enough, the entrance was not obvious at the top of the hill so missed it and had to double back. A narrow and rough, meandering dirt road guided me through the small tree-filled cemetery. I wasn’t sure how easily I would find the family plot, but knowing that Sam, Jr.’s headstone was tall I thought I would have a better chance, and I was right. 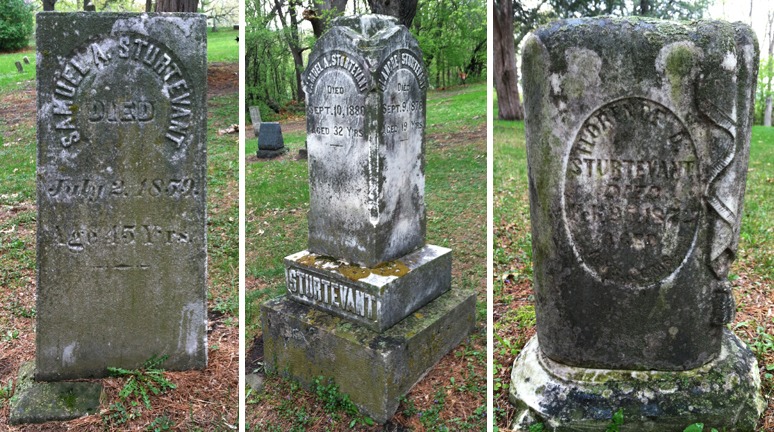 About ten yards off of the north side of the path, I saw the Sturtevant tombstone. The drizzle eased up a bit but the wind was still making its presence known. I gingerly walked over to the grave site trying to stay warm. There they were. The final resting spot of half of the family I have been researching for over a decade. Facing the main headstones, Samuel Sr. lies to the left, with Samuel Jr. and Blanche sharing a stone in the center, and Florence to the right. Florence’s tombstone faces the other way and unfortunately has deteriorated with weather, moss, and lichen. 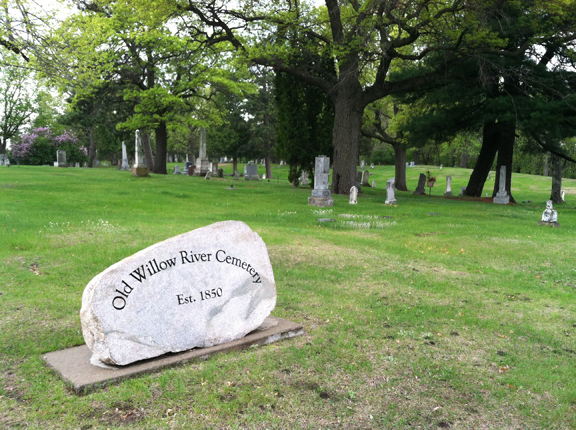 (See a website for the Old Willow River Cemetery to see older photographs with better detail.) 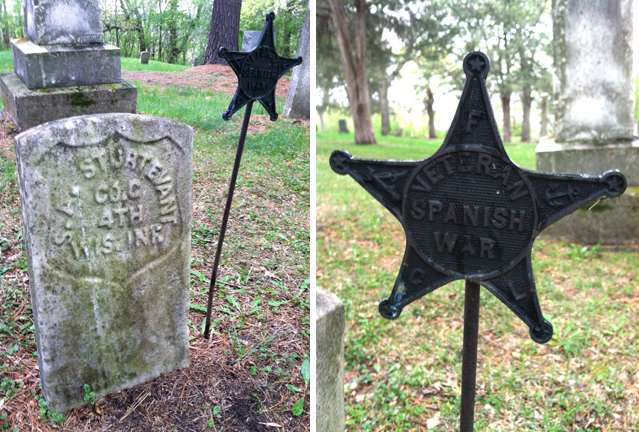 Samuel Jr.’s stone has a second military marker, and a mistakenly placed “Veteran Spanish War” marker on his grave. Samuel served in the Civil War as a private in the 4th Wisconsin Cavalry, Company G, and died long before the Spanish-American War even began. For better detail go to the people’s individual blog pages to see photos taken several years ago before the damage on the stones occured. Samuel the younger’s military headstone with the iron star honoring Sam in the wrong war. Visiting the family graves, or graves of anyone I’m researching, is always a sobering experience. These people are of no relation to me, but I feel like I know them. Through my research they become very real as I learn the little details about them as individuals. I am thankful to have found a way into their “lives” and I am honored to tell their stories. After snapping several photographs of the tombstones and the overall family plot, I shared my appreciation and respect, out loud, to those four people long gone. About twelve miles southeast of Hudson lies River Falls. This small town houses a very nice four-county collection (which includes St. Croix) and is one of several regional university repositories for the Wisconsin Historical Society. A large street construction project going on along the the school’s main thoroughfare made parking a challenge. There were few options nearby so I opted for a tiny parking lot a few blocks away. I was a bit daunted at the idea of meter parking and grabbed a handful of quarters out of my bag. 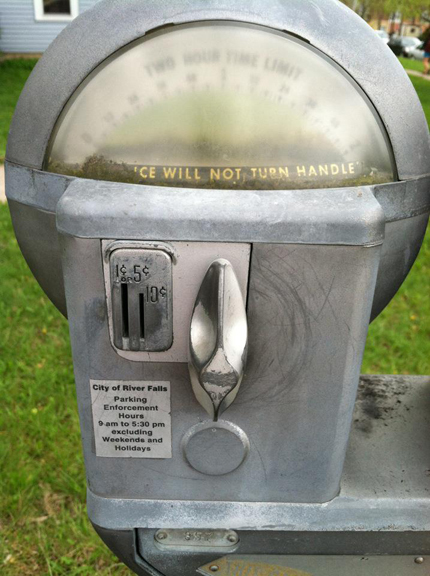 Shocked as I stared at the meter, it didn’t take quarters! It only took pennies, nickels, and dimes…WHAT?!?! Completely floored, I inserted two dimes in the meter for two hours of parking. Why even bother with parking meters if the fee is so cheap? Maybe the parking tickets are brutally expensive. I wasn’t planning on finding out so I fed the meter at lunch. I never knew penny parking meters existed! As I expected, doing research on the Sturtevants was a hit and miss affair. Digging around in the early years of a town’s development creates certain challenges. Some of the earliest consistent records you can find are land records, but many early documents can be quite random. Unless someone is famous or infamous you need to be creative in finding material. I looked through quite a few records at the Research Center, but unfortunately I didn’t find much on the family. The main culprit facing Hudson was the loss of records during the devastating fire of 1866. I only found a few items, mainly stories about early Hudson, references to newspaper articles, college term papers about Hudson-related topics such as steamboat travel, and some curious details about the schools in St. Croix County in the late 1850s. The items found that had family significance I found in the newspapers. One was a burial notice of Samuel Sturtevant, Jr. “Samuel Sturtevant, formerly of this city, lately of St. Paul, was buried here on Tuesday. He died of consumption, after a struggle fore life lasting since his early boyhood. This makes four of the Sturtevant family, Mr. Sturtevant and three children, who have died of consumption and been buried here.” (1) I knew Samuel, Jr. and his sisters died of consumption, but since I haven’t been able to find a death record for Samuel Sr., I was never quite sure of my suspicions. While a newspaper obituary is not absolute proof, it’s the only proof I have right now about Samuel Sr.’s cause of death. I’ll take what I can get! The other key item was a probate notice regarding Samuel Sturtevant Sr.’s death and guardianship matters for Samuel Jr. and Joseph Sturtevant. This was the first of several serendipitous moments mentioned earlier. My initial goal was to locate some kind of death or burial announcement for Joe’s father Samuel. As luck would have it, the weeks surrounding his death in July 1859 were not available on microfilm…possibly lost and never to be available. Examining the label on another microfilm roll case I noticed a confusing note about one issue of the Husdson North Star that had been filmed out of order. It was one oddball newspaper from mid-August 1859 stuck in the middle of some of the June issues. I had little hope but decided to check it out since it was one of the only newspapers available even remotely close to Samuel’s death. Since closing time was getting nearer, I was quickly skimming the paper for any kind of “Sturtevant” sighting. When you research a name long enough, it tends to find a way of jumping off a page when you aren’t looking directly at it. Just as I inched the microfilm reader to take me to the next page of the newspaper, I caught “Probate” “Sturtevant” and “Minor” out of the corner of my eye at the far right-hand side of the page. What was this?!? The name Silas Staples sounded familiar. If I remember correctly he is the same man who signed a letter allowing the underaged Samuel to enlist in the Wisconsin Cavalry in 1863 at the age of sixteen. I was also quite curious about the real estate. A section of land is 160 acres…that’s a large chunk of land held in the name of two boys age eleven and eight…hmmmmm. I added another item to the list of property records to check out at the county deed office the next day. As the long research day finally ended I left the little town of River Falls and drove back to my hotel, a different and ultimately MUCH more comfortable hotel, in Hudson. I grabbed an early dinner, made some notes for the following day and then crashed for the night. (1) Hudson Star-Times, 17 September 1880, p 4, c 1. (2) Hudson North Star, 17 August 1859, p 2, c 7. After several months of crazy work and personal time I am FINALLY able to get this post up. Jeeze! Way back in March of this year I met with a woman named Jean who stumbled across my blog last summer. Last November I got a quick second note from Jean, who after reading my post about Samuel Sturtevant’s probate records, told me that her mother was the cousin who received the Sturtevant estate! The family of Joe’s wife, Anna Lyckman, remained in Colorado and the cousins stayed in contact with Sam and Lotta in Denver. Jean now lives in the Denver-Metro area and we got together over lunch one snowy afternoon in March. We had a blast chatting about her family, Joe’s family, and we both learned a lot from each other! Jean brought with her some photocopies of just a handful of items she has from the Sturtevants…I was thrilled!!! There are some photos and drawing I had never seen before, certainly a wonderful collection of family treasures, and I was so giddy to see what she brought along! 1) The correct pronunciation of Lyckman sounds like “Lickman,” which explains the spelling variations I’ve come across. Being German, I had been pronouncing the “y” like the long “i” in pie, to which I am accustomed. I had a difficult time finding details about the Lyckman family but Jean filled me in on some of the family stories and shared some wonderful photographs. Some of the photos show both the Lyckman and the Sturtevants together…priceless! 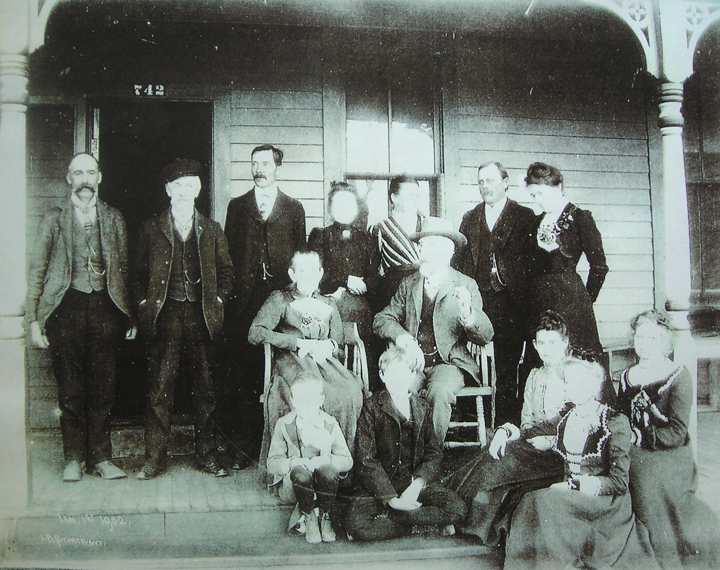 This New Year’s Day 1902 photo was taken on the Peck’s front porch at 742 Marine Street, right next door to Joe’s house. I know William Peck is the gentleman seated on the chair on the right and his wife Jemima, (Joe’s mom), is most likely sitting next to him. The man in the doorway with the cap on is possibly William’s brother, Henry who lived with them for a time. He has that “Peck” look about him. The woman in front of the window looking to the right is Anna Lyckman Sturtevant (Joe’s wife) and her brother Gustav stands next to her. Gustav’s wife, Bertie Johnson Lyckman is the dark-haired woman seated on the steps. The other two young girls could be Joe’s two daughters, Florence and Blanche. I hope to see a clearer image soon with the hopes of better identifying each person. Photo courtesy of Lyckman family archives. 2) I knew Joe’s daughter Florence married into the Jones family, but I didn’t know they were apparently one of Denver’s society families. I believe her mother-in-law, Louisa (O’Brien) Jones owned some Denver hotels which I think Florence helped operate for a time (need to check into that a bit more). Florence also ran the Kilbourn Apartments at 847 East Colfax beginning in the early 1910s until she died in 1928. The building, unfortunately, is no longer standing. Despite Florence’s husband William turning out to be a deadbeat, she remained in good graces with her mother-in-law, Louisa. I know “deadbeat” sounds harsh, but according to their 1910 divorce papers Florence claimed William never held a job very long and had no interest in working while she was the sole breadwinner. The divorce was granted. According to Jean, Florence was quite popular and apparently mingled in the same social circles as Margaret Brown (famed Titanic survivor “Molly” Brown). Should be fun researching Florence in more depth! 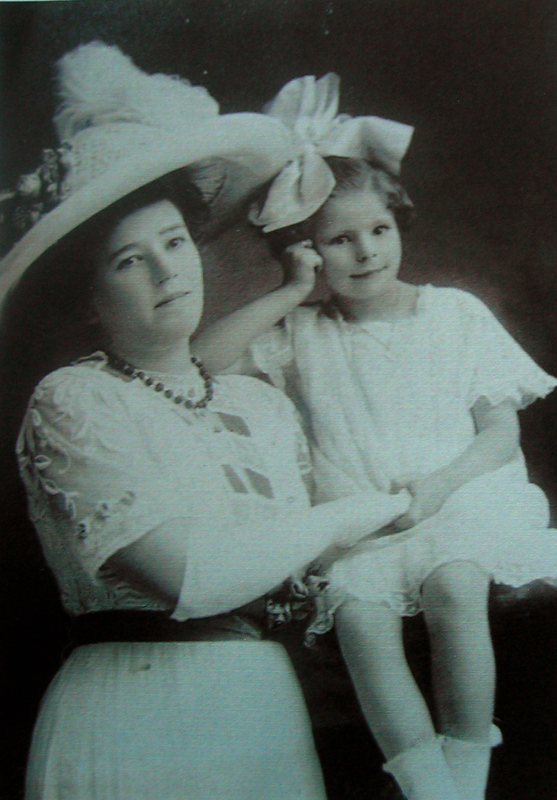 Florence Sturtevant Jones with her niece Blanche Josephine Sturtevant, daughter of Samuel and Lotta. Photograph taken before 1916 when Blanche died suddenly in Denver at the age of 10. Photo courtesy of Lyckman family archives. The Kilbourn Apartments “The Home of Old Fashioned Hospitality” was owned and operated by Florence Sturtevant Jones. 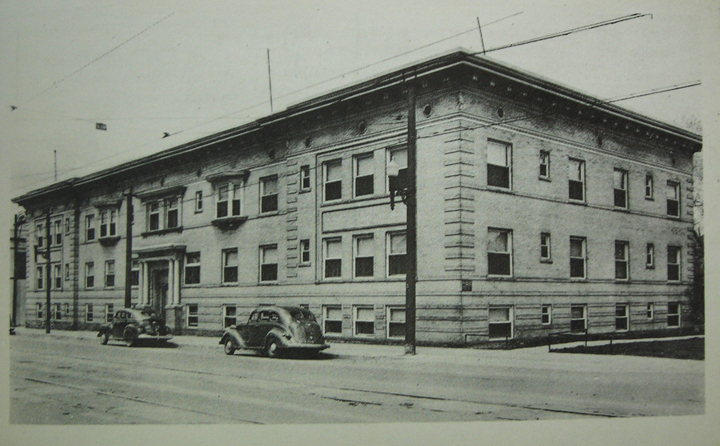 Originally located at 847 East Colfax Avenue in Denver, the building site today is a parking lot. Photo courtesy of Lyckman family archives. 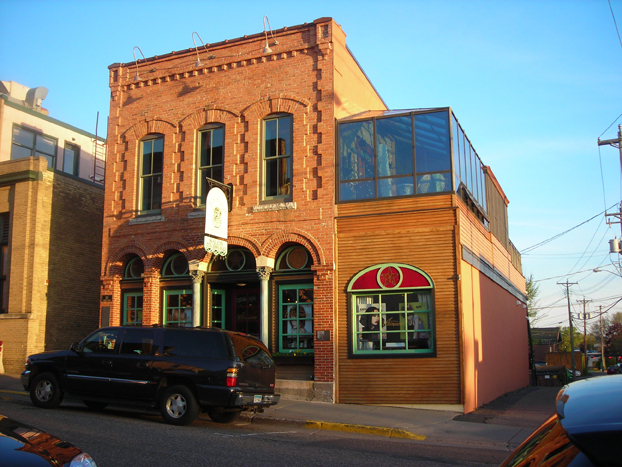 4) After Sam and Lotta married they moved to Grand Junction, Colorado where Sam worked as a pharmacist and owned a drug store. Sometime in the 1910s they moved just a bit west to Fruita. I always assumed that Sam just continued in his trade, but apparently he and Lotta also owned an operated a little movie theatre, the Majestic Theatre! It looks like another fun side research project is in store for me to find out more about what life was like in Fruita for Sam and Lotta. 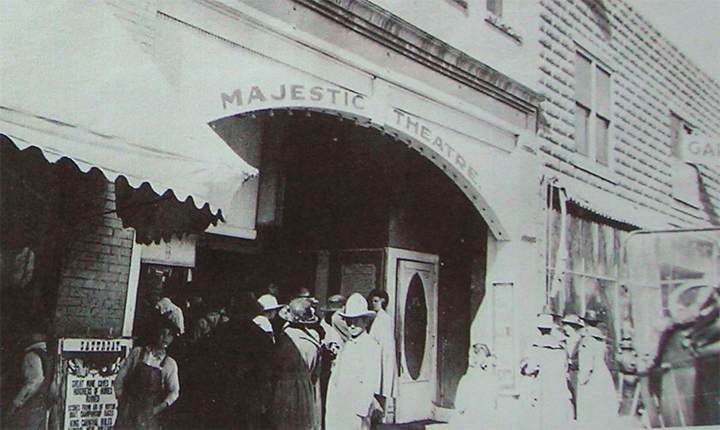 Entrance to the Majestic Theatre run by Sam and Lotta in Fruita, Colorado. Photo courtesy of the Lyckman family archives. I hope to meet with Jean again soon! Time flies when you are sharing information and stories, three hours just are not enough! It’s been awhile since I checked out Fold3 (formerly Footnote), so today I explored the site again to see what new records were available. The site is geared toward military records, but they also have some other choice items. I stumbled across the section for city directories and thought I’d look into Wisconsin and Minnesota for towns I’m researching. I wasn’t expecting much since most websites I explore don’t have the places and timeframes in which I’m interested. Well, today I was in luck! City directories were available for St. Paul, Minnesota during the 1860s and 1870s! I had looked at a handful of directories from the Family History Library in Salt Lake City several years ago, but Fold3 had a few extra ones. St. Paul Directory for 1867, vol 3 (St. Paul, MN: Bailey & Wolfe Publishers, 1867) 83, FHL Film 1377507. One item I totally forgot about from my SLC trip was a nice little ad for Joe’s mom, Jemima, advertising her millinery skills. After her husband, Samuel, died in 1859, she took up her former hat-making trade to support her young family. This ad from 1867 was a great gem confirming her continued work. Researching women is often challenging since it can be difficult to find evidence of a woman’s existence and contribution to her family and society. Check directories for women’s names, you just might find out your ancestor owned her own shop! While you are looking through the directories for family names, don’t forget to make a note of what someone did for a living. You might be able to glean a few more details if you find out about someone’s trade or who their employer was. St. Paul Directory for 1869 (St. Paul, MN: Ketchum-Crawford Publishers, 1869) 178, FHL Film 1377507. William S. Peck, Joe’s step-father, was listed as a painter in the 1869 St. Paul directory. (1) It only listed his work address as 18 W Fourth. 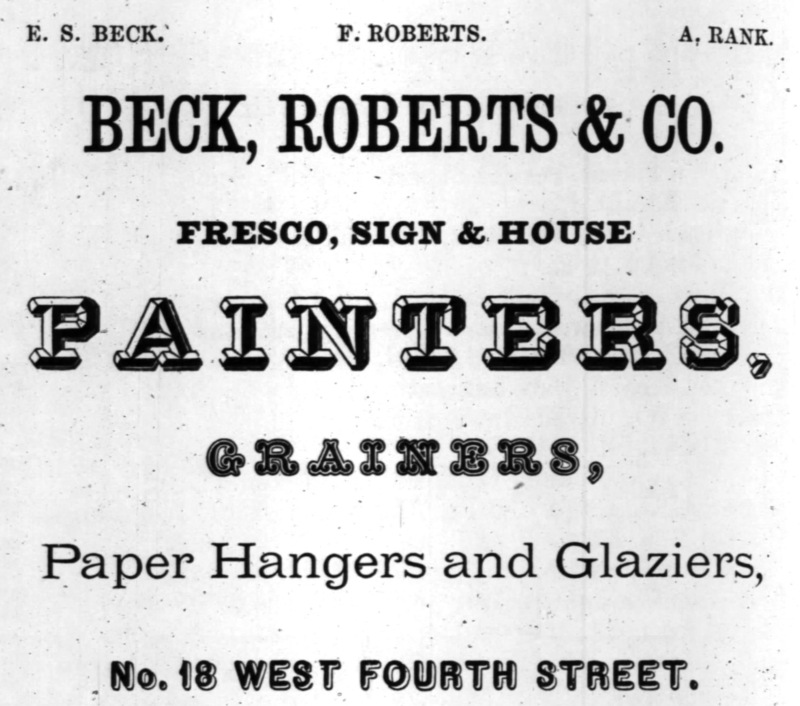 I could have stopped there, but when I looked up painting companies in the trade listings, the only business at that address was Beck, Roberts & Co.(2) My patience finally paid off as I scrolled through EVERY page, and I found an ad for Beck, Roberts & Co. describing the type of painting work the company offered. If I didn’t take the extra time to dig a little deeper to try and answer a few simple questions, I would have missed the wonderful addition to William’s story. Take your time looking through city directories, you just might be surprised what you find. Directories are often a wealth of local history with biographies, the history of the town’s founding, maps, street listing, information about local government, elected officials, businesses, churches, schools, and fraternal organizations…just to name a few. Make sure you don’t forget to add these fantastic sources to your research plan! (1) St. Paul Directory for 1869 (St. Paul, MN: Ketchum-Crawford Publishers, 1869) 137. (2) St. Paul Directory for 1869 (St. Paul, MN: Ketchum-Crawford Publishers, 1869) 223. Most of these can be seen as a stretch of the truth, a minor error in time, or as with the Illinois reference the family probably traveled through the state on their way to Wisconsin. But the California connections always confused me. There was no evidence that anyone, especially Joe’s parents, ever made it out to California. Where did those links come from? 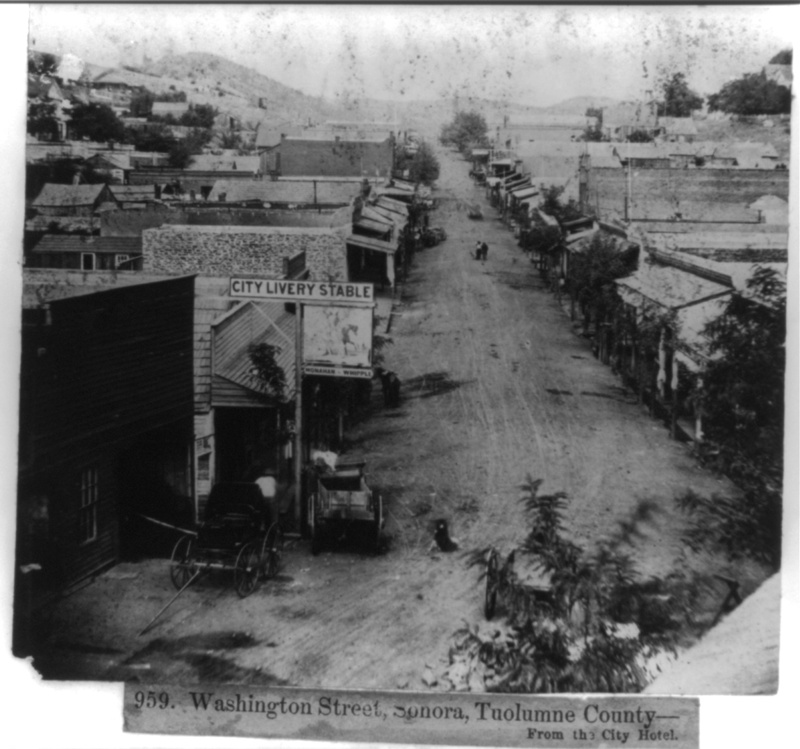 "Washington Street, Sonora, Tuolomne County from the City Hotel," Lawrence & Houseworth, publisher, 1866, albumen print, Library of Congress Prints and Photographs Division, Washington, D.C., LOT 3544-45, no. 959. They came from Joe’s maternal grandfather, Bevier Depuy! Traveling nearly 3000 miles from Sullivan County, New York to northern California in late 1849 or early 1850, this blacksmith tried his hand at mining in the area of Sonora, Tuolumne, California. The 59 year-old saw opportunity and took a chance, just like the tens of thousands of other people from around the world. Like most men who sought easy riches in gold, Bevier probably didn’t have much success and soon returned to blacksmithing. Rather than return to New York, he decided to make a life with his second wife and three children amongst the gold fields. He remained in town of Shaws Flat outside of Sonora until his death in 1865. While there is still more research to be done to expand on Bevier’s life and adventures, the 1849 Gold Rush connection has been solved! I woke up Friday morning, ready to go, and prepared for my brain to hurt by the end of the day. The drive to the studio was quick and when I arrived I found everyone there excited and chomping at the bit to learn! We did the obligatory introductions and talked about why we were all taking the workshop. Everyone else had much stronger photographic backgrounds than I did, but at least I have darkroom experience and know my way around a camera. I wasn’t worried about getting lost. Quinn spent some time discussing his background and spoke in-depth about early photographers and the history of photography. It was a great overview that gave me a better grasp on how to approach learning about how Joe worked. The large, open studio was pretty chilly that November morning so after all the intros Quinn got us up and moving around rather than sitting and talking about chemistry. We’d hit all the nineteenth-century chemical recipes after lunch. Quinn just jumped into the deep end and started walking us through the process of making some photos!! 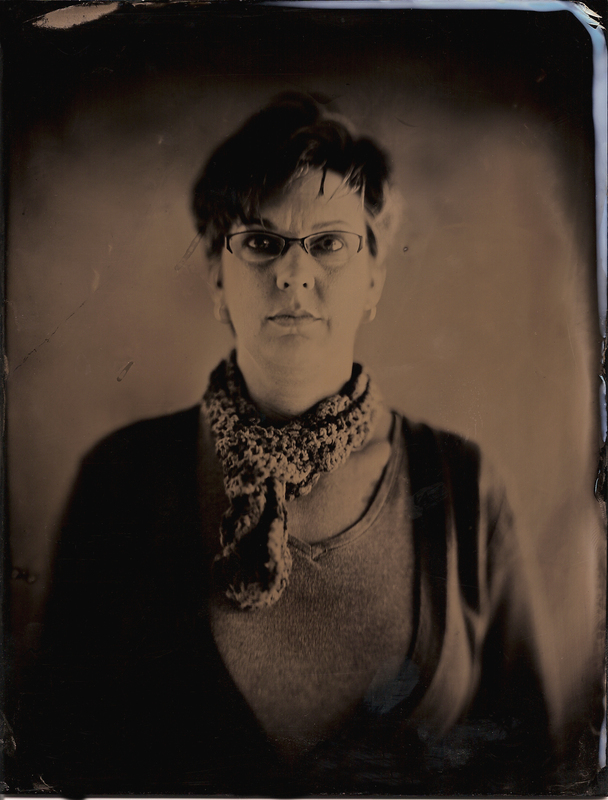 Photo of me taken by Quinn Jacobson, full plate black glass ambrotype, 2011. I was the first guinea pig to sit for a photo. Like little ducklings we followed Quinn to his portrait set-up near the front window. I sat on a stool to get properly framed and focused. Because these photos can have long exposures you need to be as still as possible. I leaned into one of those old-style head rests to keep my head steady for focusing. At first it felt odd with a lobster-like clamp on the back of my skull, but once I relaxed I knew I wouldn’t have to worry about having a wobbly and blurry head in the final photo. All set! Jumping off the stool I eagerly walked with Quinn and the others back to the work area to watch the magic unfold. Each one of us sat for a photo that used a different approach. Whether it was a different substrate (clear glass, black glass, or black aluminum) or photographic technique (different lenses or depth of field) we learned how to create various looks that we could play with the next day. 1. Cut the glass. No matter the size of glass you decide on, make sure it fits into the plate holder you will use in the camera. 2. De-burr the glass plate. This not only keeps you from cutting yourself, but it also creates a little ridge allowing the liquid collodion emulsion to stay on the plate. 3. Clean the plate. A mild abrasive removes any oils or impurities off the glass allowing the collodion emulsion to properly adhere to the plate. 4. Pour the collodion. This is really when you need to double-check your plan of attack because once the collodion is poured, it’s the point of no return…everything needs to happen quickly since the emulsion needs to stay wet. 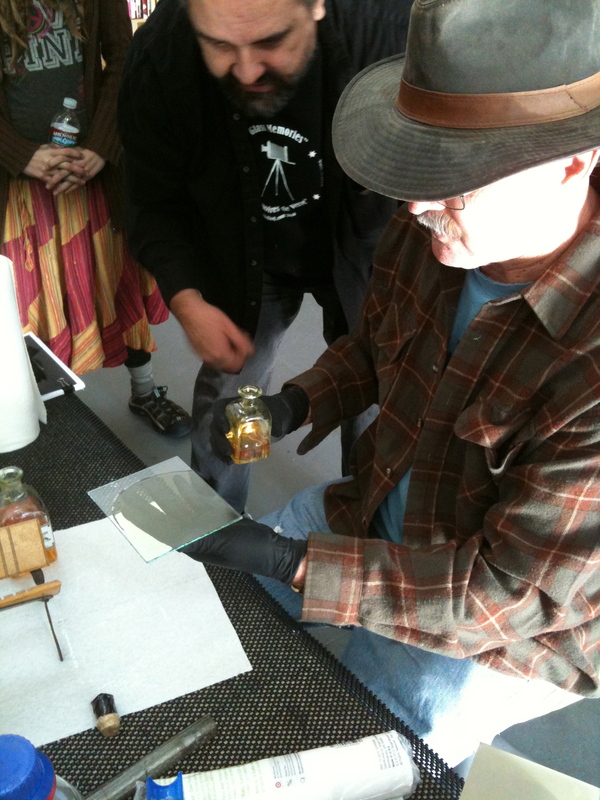 Pouring a puddle of collodion is easy, it’s the spreading of the emulsion that takes a steady hand. (I get to find that out the next day!) Once the plate is covered, hopefully with no spills, the extra liquid is drained back into the bottle. Now the clock starts ticking. 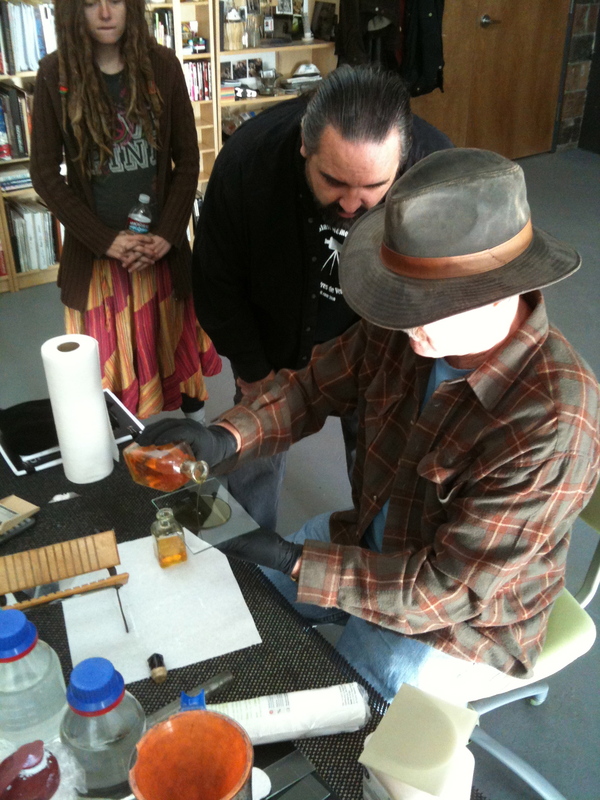 Quinn coaching a student through pouring collodion on day 2. Quinn talking through the delicate process of spreading the collodion on the plate, and KEEPING it on the plate. 5. Sensitizing the plate with silver. Off to the darkroom! (Sorry, no darkroom photos.) The collodion should be skimming over ever so slightly as you dip the plate into the silver nitrate bath. Three minutes later the plate is light-sensitive. It’s now ready to leave the bath, get its edges and back dried up a bit, get mounted into the light-tight plate holder, and finally on its way to make an image. 6. Taking the photograph. Sit your subject back into place (I jump back onto the stool), and double check the head rest, subject positioning, and lighting. Think about what your exposure should be (I’m still figuring out how to do this). Since the initial framing and focusing happened before the whole process got rolling, you should only need to fiddle with fine-tuning the focus. Get the black drape over your head, shoulders, and camera, and take a close look at the image on the glass plate on the back of the camera…remember the image is upside-down and backwards. If it all looks good, time for the “film.” As the plate holder gets mounted on the back of the camera, it’s an unnerving and wobbly affair. You can’t help but think the whole camera is out of whack and out of focus at this point, but it’s the only way to do it, and it all works out fine. Make sure the cap sits loosely on the camera lens, pull the divider out of the plate holder, take a deep breath, take off the lens cap, count out your exposure, put the lens cap back on, and place the divider into the plate holder before removing the whole frame from the camera. Once again off to the darkroom! 7. Developing the image. Remove the plate from the holder. Make sure you have the emulsion side up. It’s difficult to believe there is an image trapped in that cloudy emulsion on a simple piece of glass. Under the red light you hold the plate in one hand, a shot glass of developer in the other, take a moment to collect yourself and quickly pour the developer over the emulsion trying to make it in one smooth movement. One pass is usually not enough so the extra developer goes back in the shot glass and poured again. Shaking the plate slightly helps the developer move around and do its magic. In about ten seconds the image begins to appear. The nerve-wracking point is that you only have one shot at creating this image…you need to figure out where the sweet spot is in the development time. There is no magic number, experience is the only way to really understand how to look at the image and know when it’s right. Once it’s where you want it, stop the development with a rinse under the water faucet. 8. Fixing the image. Fixing removes the excess silver from the plate and stabilizes the image. The excess silver makes the image appear as a milky negative. Once in the fixing bath the silver is washed away, the glass clears up, and the positive image reveals itself. 9. The final wash. To finish things up the plate just needs to sit in a water bath for about 5-10 minutes. Then the plate can be dried and varnished for an archival finish. Check out a second part of Quinn’s interview on Channel 4 to watch the process! After lunch we went through the seriousness of creating all the chemicals needed to undertake this fascinating art form. We learned nineteenth-century recipes for making everything: the plate cleaner, to the collodion, the silver nitrate bath, the developer, two types of fixers, and the varnish. I won’t go into much detail here since I’m not very knowledgable about chemistry in general. However, the one thing that is important to note is that one of the fixers commonly used in this form of photography is potassium cyanide. Even though it is a weak solution it can still be very dangerous. A bit unnerving to say the least, but the images it produces are incredibly beautiful. There is a safe fixer that produces similar results, so there is another option. Besides being overwhelmed and excited about this new knowledge and really having a feel for what Joe did for a living, I now have a much better eye at how to look at old photographs. After this day was over I realized two significant things. One is that when you look at a tintype (or an image on dark glass) you are looking at that portrait in a different way than you’d think. Because the image is reversed, you are seeing that person as they see themselves in the mirror. So if you have old tintypes, scan them and flip them in an image editor to see what someone really looked like! 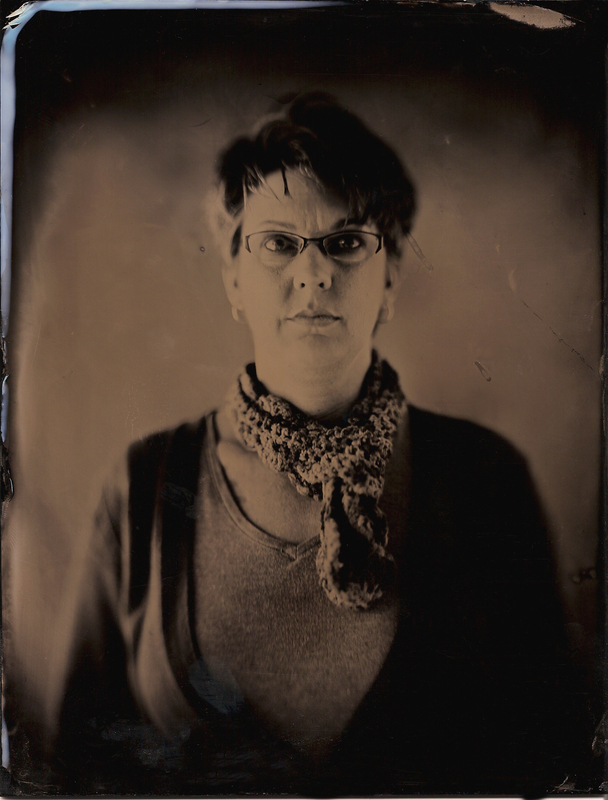 Two, because the collodion is ultraviolet (UV) sensitive, it reacts to a different range of the color spectrum. To put it simply, the high end of the collodion range goes into UV so areas that reflect UV will appear white in the photo even if our eyes don’t see that brightness. The low end of the collodion range starts dropping off around green, therefore anything that is mainly yellow, orange, or red will appear black. It made me think that the world was a much more colorful place than we assume based on all those old images. Next time you look at old photographs and see people wearing so much black…think again, the clothing might have been much more vibrant and stylish than what we thought! Day Two of my workshop, coming soon! It was a Tuesday morning and I saw a spot on the Denver Channel 4 news covering local artists for open studio events on the upcoming Second Saturday. I rarely watch this channel but I happened to be flipping through when I noticed a reporter doing a piece about a photographer in the River North Arts District who specializes in nineteenth-century photographic techniques. I watched in fascination and I kept saying to myself, “I gotta interview this guy!” How cool to talk to someone who understands and practices the photography that Joe did for a living. I looked up Quinn Jacobson’s website to find out how to contact him, and what I found totally blew my mind. He offered CLASSES in how to do this technique!?!?!? NO WAY! The though of taking a class seemed like it would be such an amazing learning AND research experience. Then I saw the schedule…he was offering a class on Friday…as in three days! *Gulp* Could I get in on such short notice? I’m sure he already has the maximum of four people for the class. Well, it doesn’t hurt to ask, right? I quickly wrote Quinn an email explaining my goals and asking if it was possible to squeeze me in. If not, I told him I still wanted to talk to him until the next time he offered the workshop. About an hour later he emailed back, stating the class was full but there was one person he wasn’t totally sure would be there. He told me to hang on a couple of days and check back. Argh! Those were an anxious couple of days! I checked in with him again Thursday morning, ready to accept my defeat, and kindly asked when he planned to hold his next workshop. About 20 minutes later, just as I’m leaving for work, I get the email…I’M IN! Since he wasn’t sure when he would offer another workshop and he liked my reason for taking the class, he said he’d squeeze me in!! I was giddy all day. I knew about photographs on glass plates, but I didn’t know that was called wet plate collodion. I did a little bit of research that night, but still went into the class pretty clueless about what to expect. What I found out, to put it simply, was that this process, developed by Frederich Scott Archer, essentially killed the one-of-a-kind daguerrotype. This photographic technique made it possible to create a positive image on glass against a dark background (an ambrotype), a positive image on metal (a tin type – aka ferrotype) or a glass plate negative for creating multiple prints. The reason it’s called wet plate is that the emulsion (collodion) needs to stay wet through the entire process; from pouring the emulsion on the plate, to sensitizing it with silver, taking the photograph, and then developing and fixing the image. This gives you about 5-10 minutes to do EVERYTHING! 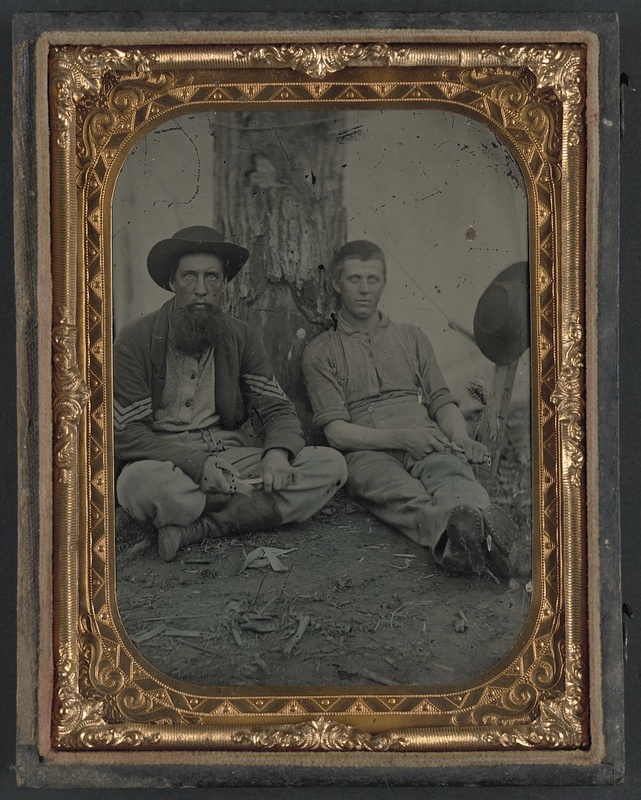 "Unidentified soldier in Union uniform and unidentified young man sitting on the ground and whittling," between 1861 and 1865, quarter-plate tintype, Library of Congress Prints and Photographs Division Washington, D.C, AMB/TIN no. 2797. Just think about all those Civil War-era images you seen in documentaries, online, or in your own family’s collection. If they are dated from the early 1850s to roughly the 1880s, the photos were most likely produced using this technique. For those of you familiar with the western photographer William Henry Jackson, he made all of his famous survey images using this process. By the 1880s the glass plates were mass-produced using a dry gelatin emulsion making the wet plate less common. The new dry plates allowed for more flexibility, no need to develop the image immediately, and allowed for faster exposures. I was anxious for what the next two days would bring. I got up early that Friday morning ready for a long and exciting day! Follow my journey in the next couple of posts…COMING VERY SOON!! !